WITH: Top: Prague/ Jeans: AEO / Necklace: Dorothy Perkins/ Bangle: Vintage/ Bag: Aldo/ Sunnies: Karen Walker/Nails: Bourjois 1 seconde nails. 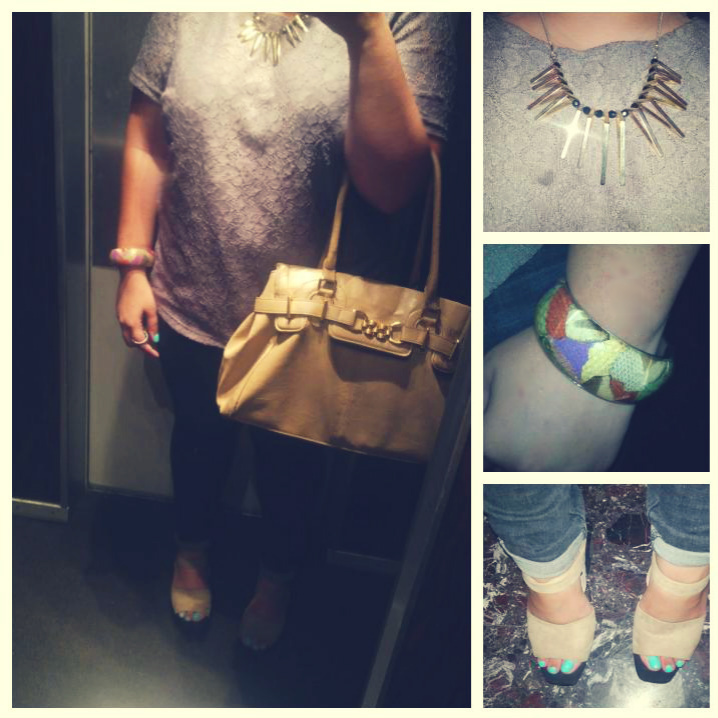 I forgot to take a proper outfit shot, so I guess this awkward elevator shot/collage will have to do? Documentation purposes only. This was my outfit for the Mirna Chaar fashion show in Beirut Souks yesterday.The show consisted of two parts, Jaz & Ginger collection which basically consists of fun everyday pieces and the Mirna Chaar collection which was the dressy couture line... but more on that later. I was in the mood for neutrals and was looking for a chance to wear my latest shoe love from Zara, so I opted for a khaki lace top, black jeans, gold statement necklace and a beige handbag. If you have liked my facebook page, you might recall that I posted a pic of these babies a while back. I had almost forgotten about them until the bestie and I passed by Zara a couple of days ago. They were on sale for 25,000LL which is a ridiculous bargain!! They're SO comfy, although SUPER high, I seriously felt like a giant towering over the little people. It's an odd shoe which is not to everyone's taste, but I love them oh so much and I'm going to wear them ALL summer!